Polka King's birthday was coming up and I asked him where he wanted to go. He's not a picky guy, so he usually doesn't have an opinion one way or another. However, ever since his first visit to Miku, he has been raving about it. For him to rave about anything is something special. Other than his beloved music equipment (for his polka'ing), it would be hard to get anything out of him. Thus, he was pretty much in agreement that we meet up at Miku for his birthday. Hey, that worked for me. A visit to Miku has been a long time coming. 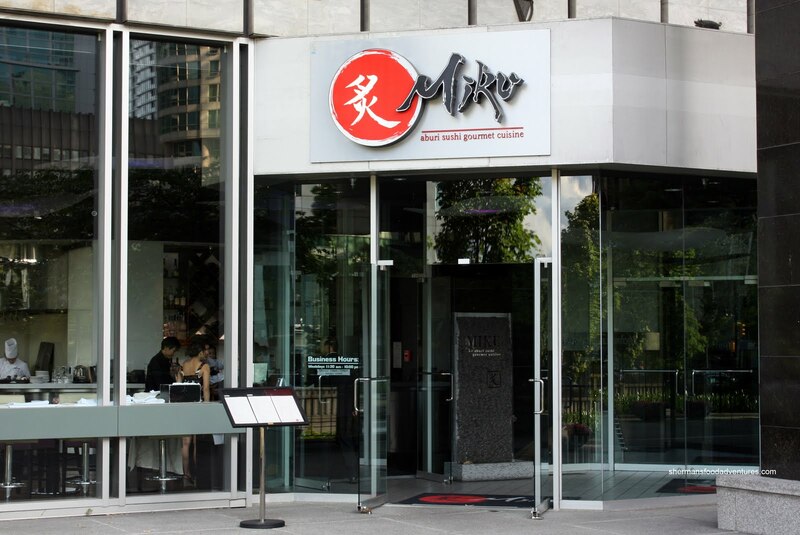 Situated where the Spotted Prawn used to reside, the dining space is modern, trendy and comfortable. Joining us tonight were Emilicious, Lionel Hutz and Milhouse. When Milhouse and I arrived, we were given the opportunity to sit out on the patio since it was a fairly nice day. Probably the best day so far in our Spring/Summer. 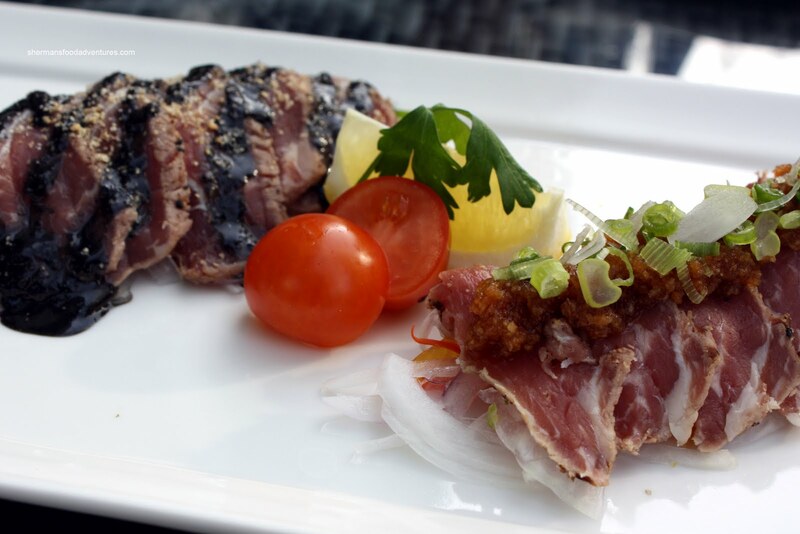 We started out with the a Abu Tuna which was comprised of a sliced seared pieces of tuna rolled with red onion and peppers topped with masatake sauce. I'm not a huge fan of raw onions, so it was not really my cup of tea. Actually, I found that the copious amount of onion detracted from the tuna and it seemed to get lost flavour-wise. Yet, it did succeed from a textural standpoint since the crunchy onions were a nice contrast to the soft tuna. 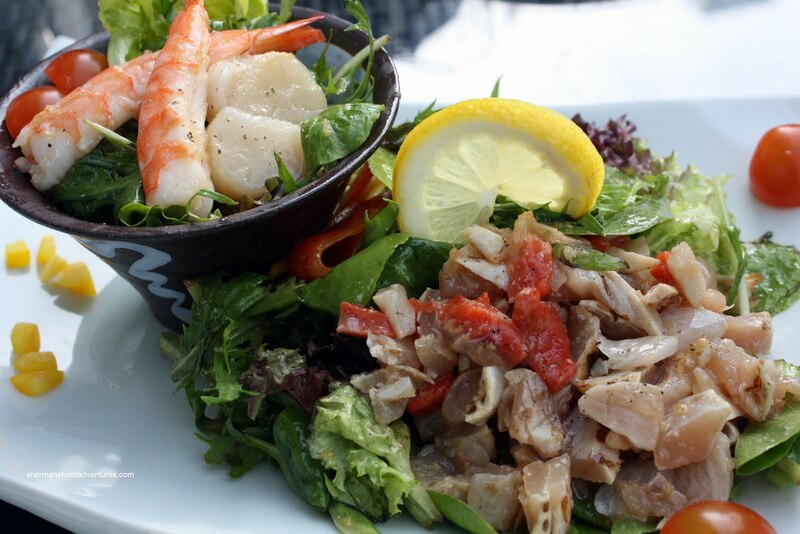 Usually, when we order a Sashimi Salad, it can be somewhat of an underwhelming experience because you really don't get much in the way of seafood in relation to the lettuce. However, the version at Miku was quite substantial. Consisting of 2 separate sections with one topped with a generous amount of sashimi and the second topped with 2 ebi and 2 hotate, it was no whimpy salad. It would've been perfect if they hadn't drenched the whole thing with dressing. 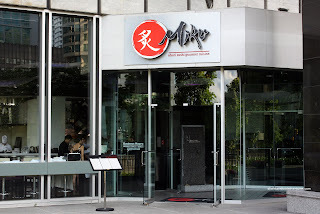 By virtue of already dining at Miku twice, we got Polka King to suggest a few dishes. 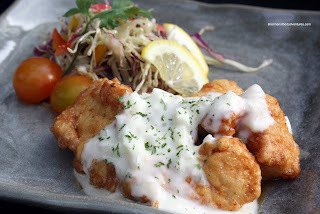 One of which was the Chicken Nanban. When I read the description on the menu, I thought it was a misprint. House-made tartar sauce on fried chicken? Then I thought about it, I personally like tartar sauce on anything, especially fries. And you know what? This wasn't bad. The lightly battered (and I mean barely there batter) chicken was tender and lightly seasoned. I found it pleasant to eat, if not slightly bland. From fried to raw again, we had the Gyu Carpaccio with 2 different dressings. The first was a black sesame and the second appeared to ginger? I wasn't paying attention. The beef was really tender and sliced perfectly thin. I particularly liked the black sesame dressing, it had a understated nuttiness to it. For me, I ordered the highly unsharable Sablefish Saikyoyaki. Well, it is sharable, it just becomes a bloody mess once divided. As Victoria and I discussed a while back, it's pretty hard to mess up sablefish (aka Black Cod). It does happen; but rarely. So I was expecting this dish to be good and it was. Simply marinated in miso and baked, the fish was buttery soft and had the right amount of seasoning. Arriving on a big platter, we got Miku's specialties last. Polka King really likes the Aburi Salmon Oshi, so we got 2 orders. 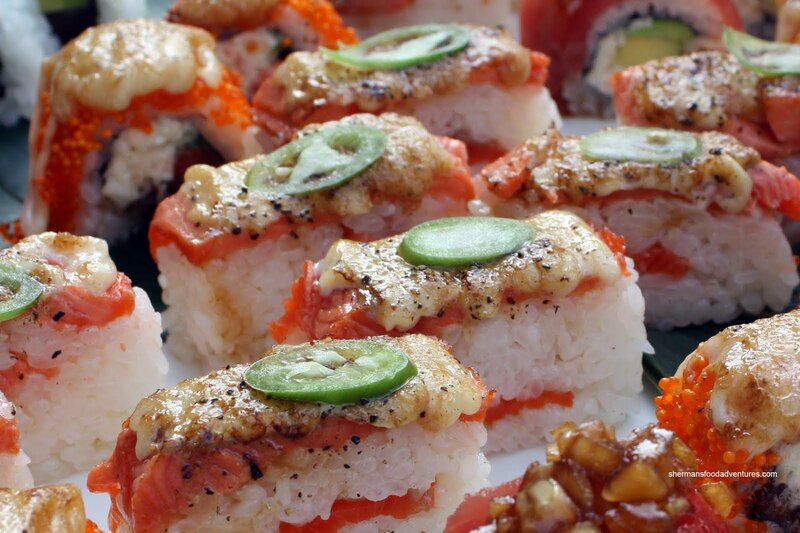 It's pressed salmon sushi dressed with Miku sauce and jalapeno then torched. 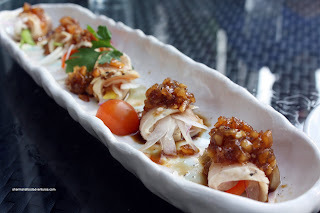 The premise behind this is to combine flamed French sauces with sushi to create flavours that are both unique and tantalizing. I liked how the jalapeno was there to provide a contrast to the fatty sauce while not intruding. As with most pressed sushi, the rice is denser. I decided to order the Miku Roll which consists of salmon, snow crab and cucumber rolled with tobiko and topped with Miku sauce. This was my favourite since the entire roll was fluffy (unlike the stiffer pressed sushi) highlighted by a natural sweetness which was accented by the Miku sauce and pop from the tobiko. I thought the sushi rice was prepared properly with a nice "bite' and a sweetness of its own. With the same masatake sauce as the first roll, the Red Wave consisted of snow crab and avocado with maguro on the outside. The roll was good with the same fluffiness of the Miku Roll while exhibiting a slight crunch from the sauce. Yet, this was ultimately a so-so roll compared to the first 2 offerings. Finally, the Seabreeze was probably our least favourite. Probably because it was not visually appealing, it was both small and lacking in colour. 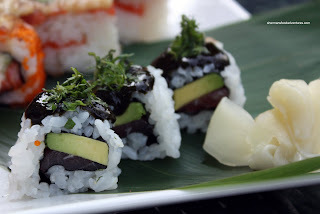 Consisting of maguro, avocado with nori sauce and grated shiso leaf on the outside, I found it bland. I know the point of this roll is to be subtle, but it was just not my favourite. Albeit on the expensive side, I found that most of the food at Miku to be crafted with care. The flavours are well-thought out and are clean. However, if someone was merely looking for "regular" sushi, this may not be the place. That is not their specialty. 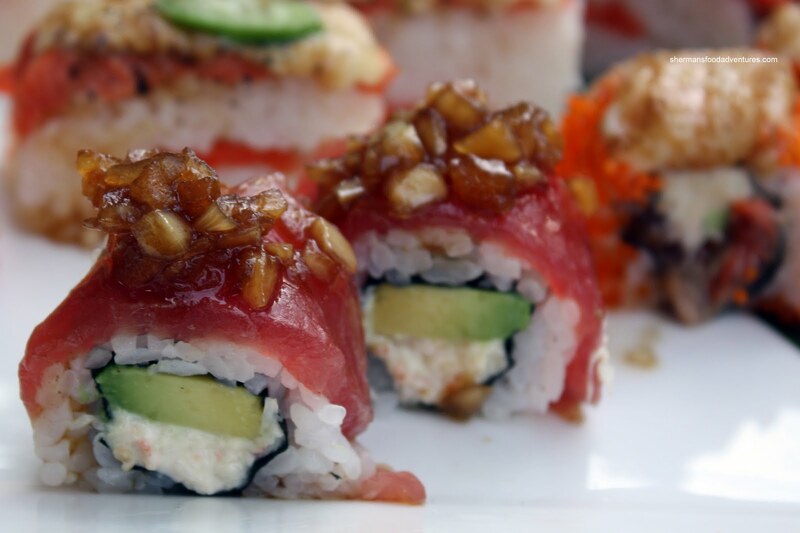 With the different sauces used in their sushi, the texture and tastes are definitely different. I personally like the concept while I can see how some would not. Thus, I tend to look at a place like this from a different point of view (ie. not looking at it as purely a Japanese restaurant). Ultimately, as with anything trendy and unique, we end up paying for it. I personally like the concept while I can see how some would not. 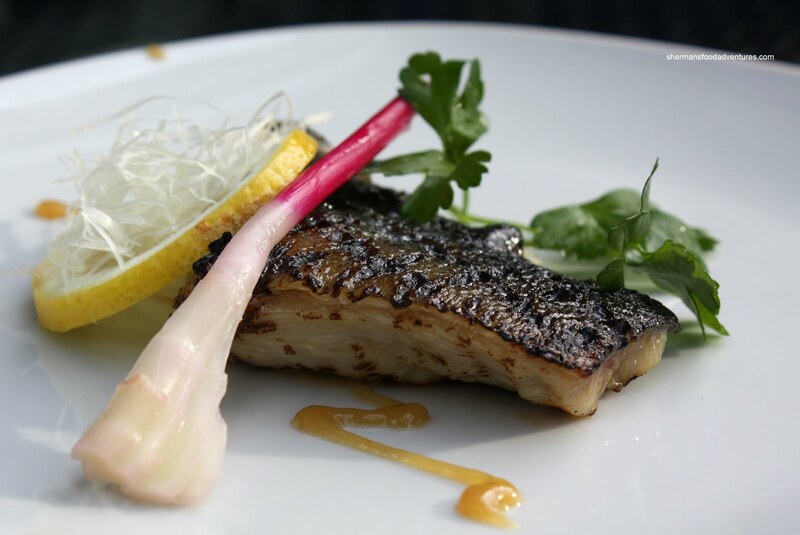 What is your thought about Japanese food clashing with french cuisine or any clash? These days restaurant are using ingredients in which they shouldn't be allow to use because it would be false advertisement? I personally think food should have no boundary or rules, however, if the concept of a dish is inspired by another cuisine. It should be written clear and not fool people, thinking this is authentic Japanese or French but a fusion? LOL Kim, actually other people have remarked that they just prefer plain sushi, so you're not alone there. As food is very personal, I can see differing tastes when it comes to saucing up maki/oshi rolls. Now with the overpowering part, I do agree it does. However, that is the intention of Aburi sushi, so, as I stated, if that is not someone's cup of tea, then Miku would not be the place for them. That leads into what Benny stated. I don't think there is an clash per se. Miku is indeed authentic, in terms of Japanese food. 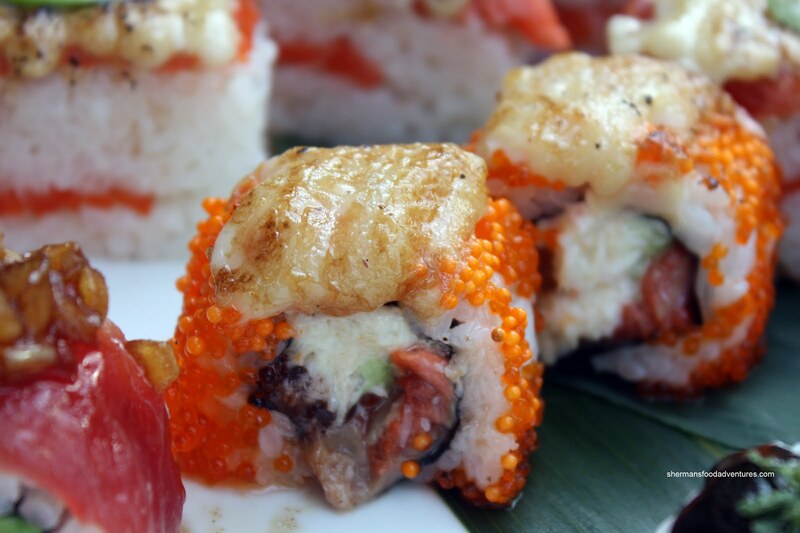 Aburi sushi is a legitmate Japanese form of sushi. Fusion? Sure. Authentic? Still sure. Personal tastes? Absolutely. i've wanted to go to this place for quite a while now but the prices keep me away. everything looks so pretty and delicious. i like what they've done with the salad - so many places put a piece of tuna and salmon over lettuce and call is sashimi salad. hmm. agreed on the dressing issue - i almost always ask for it on the side or not at all. a squirt of lemon will suffice. Trisha, go for lunch, there is this combo that is $20 and is a good sampling of what they got. I love the specialty rolls here... it's unlike any of the other ones. Your seabreeze does not look appetizing though... (that sounds kinda bad)... anyways, I think you should also try the premium aburi sushi. Each sushi has it's own unique sauce and it's plated ina way where you have to eat them right to left because the flavours get more and more intense. It's really interesting and unique. Mijune, I totally agree with you. Which would mean that we totally disagree with Kim... LOL>.. I have never been to Miku before ever since my Japanese friend Miku suggested me to go for a visit 2 years ago. Her dad is the owner of both Miku and Minami, which were named after my friend and her younger sister.The reason why I didn't visit the place is because I didn't have my own personal income back then, considering food wouldn't be inexpensive in downtown, especially the restuarant is located by the sea. Today, I was introduced to check out this fabulous blog, I saw Miku was specialized by the blogger, at that moment, I realized how successful Miku's dad is, running his business professionally, but still cook like a normal dad would do for his kids everyday. After reading this blog, I have now known where to go for lunch and dinner next time when I have a long break. I had fun reading this blog!